I wasn’t really sure what training they were taking but I asked what the format of the training looked like. 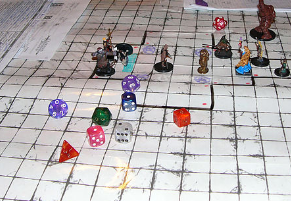 As they mentioned the simulation I started to think back many years ago when I was an adolescent playing dungeons and dragons in various basements in my community. Despite my parents concern of the game I loved to play. Even years later I clearly remember how the rules worked, interactions between character types and what activities were going to get my character more gold pieces and keep them from harms path. Simulations as they pertain to training are similar in many ways. In my opinion they can enhance knowledge that can be shared in a few days as well as promote learning. Think about the amount of content that you are expecting students to absorb in the timeframe of a few days and then expecting them to regurgitate that data to pass an exam at the end. For me, the student’s ability to learn can only happen if they truly understand the knowledge that is shared over the 3 or 4 days. I see simulations or role-playing as an opportunity for the students to understand not only the information reviewed in the course but also the behaviour that accompanies that information as it pertains to the bigger picture of integrating this knowledge back into a working (day to day) environment. Active learning not only increases comprehension, but also enhances problem solving skills as it relates to the subject. This may be a welcomed change to increase interest in the subject after days of reviewing content (which depending on the instructor could seem long). It allows participant to see, if even only in a limited way, that there are other perspectives and viewpoints within the context of real world application of the subject being simulated. Remember that even though this may just be a game there is contextual information embedded within the game itself to further promote the subject being taught. After my dungeon master flashback I made sure to relay this information to the person at the event. They agreed that they had never really thought of simulation on that level, and began to look forward to that part of the training. So go ahead, roll your icosahedron dice and slay the business dragons – enjoy your simulations and all that they help you to learn.